Multi-platinum, GRAMMY Award-winning rock band Imagine Dragons and iconic lifestyle brand Hard Rock International have joined forces to help slay cancer with Dragons, and support the band’s Tyler Robinson Foundation, through the Imagine Dragons Signature Series: Edition 33 merchandise line. The limited-edition collectible pin and men’s T-shirt featuring an original design by Imagine Dragons will be available online at HardRock.com and at Rock Shops at Hard Rock Cafes, Hotels and Casinos worldwide beginning in January 2015. 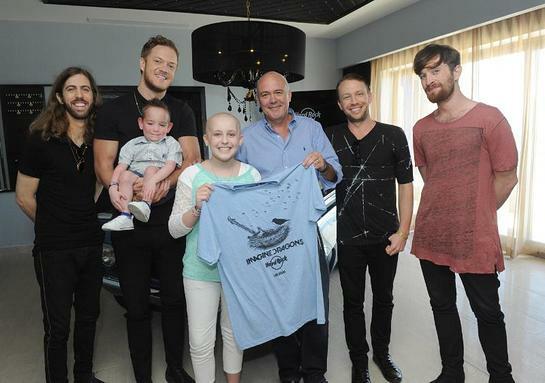 “We feel very passionate about the Tyler Robinson Foundation and are excited to work with Hard Rock to use their global reach and charitable roots to help us spread the message of Tyler and this cause,” said Imagine Dragons frontman and Tyler Robinson co-founder, Dan Reynolds. Proceeds from the sale of Hard Rock’s Imagine Dragons Signature Series merchandise will benefit the Tyler Robinson Foundation (TRF), an organization established by the band in 2013 to help families handle unexpected financial costs of pediatric cancer. TRF assigns financial advisers to families affected and covers expenses such as child care, rent, utility bills and travel costs for treatments. Through the Signature Series: Edition 33 merchandise, fans can join Imagine Dragons in their mission to support families struggling with the financial burden of childhood cancer, so they can focus on treatments and healing. Hard Rock’s Imagine Dragons Signature Series: Edition 33 men’s T-shirt ($26) is slate-blue and features an image of a bird and a guitar nestled in a bird’s nest, symbolizing the little things the Tyler Robinson Foundation does to keep their recipients and families safe and happy. The T-shirt also displays the band’s logo and a city-specific Hard Rock brand logo. The new Signature Series Pin ($12) is shaped like a guitar-pick and features an image of a bird, nest and guitar with Imagine Dragons and Hard Rock logos. To celebrate the partnership, Hard Rock will also join forces with Imagine Dragons to support the band’s sophomore album, Smoke + Mirrors, on the day of the album’s release. On Tuesday, February 17, 2015, Imagine Dragons will be the first artist to take control of Hard Rock Cafe’s internal video system, played on more than 20,000 screens in Hard Rock’s 150 cafe locations around the world. Guests who visit one of Hard Rock’s many cafe locations worldwide will experience the “Dragons” takeover first-hand, including the band’s latest video releases and other hand-picked favorites. Additionally, Hard Rock Cafe locations will offer a limited-edition beverage menu to support the Tyler Robinson Foundation through February 2015. Guests are encouraged to visit their local Hard Rock Cafe and enjoy a delicious way to give back to the cause!